I saw an ad in the cab for the TV show Jeopardy yesterday with one of the questions relating to the origin of gelato — the Italian frozen confection that I tasted for the first time in 1973 on my maiden voyage to Italy. 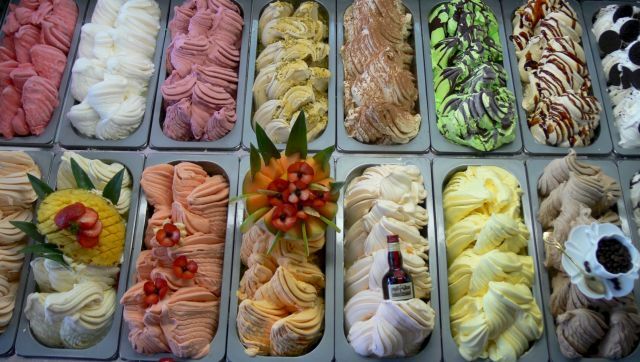 It said that the first gelato was fashioned from honey and shaved ices, but that idea is so reductive as to be suspect. For your reading pleasure, you may google the history of gelato and ponder the various theories, but what I’m pondering these days is why gelato isn’t the way I remember. We were on a bit of a quest for great gelato on our recent trip to Italy and experienced two extremes. One of the gelatos we tried was commercial and sported neon colors of fruit flavors that one never encounters in nature, yet it had the sweet, dense, velvety texture I remembered. The other gelato (the shop with the longest line in Naples) was “artiginale” and tasted so rich and creamy that it crossed the boundaries of gelato into premium rich, custardy ice cream. I longed for the gelato that I once had in Sicily for breakfast, spooned into a morning brioche, and another that I had when I was a young lass in Florence studying cooking with Guiliano Bugialli. It had tasted like nothing I ever had — as memorable as my first sip of Chateau d’Yquem. I remember the intensity of the fruit flavor, the bracing yet soft chill, the velvety, but slightly elastic mouthfeel. It was probably the first time I experienced the taste of gianduja, too — the brilliant marriage of hazelnut and chocolate. Just this week, I treated myself to a romp around the West Village (I just adore Bleeker Street these days — the whole stretch, actually, from east to west) and found two very credible gelato palaces. I will mention my favorite only. Grom, located on the corner of Bleeker and Carmine, exceeded expectations. Never mind that the adorable boy working behind the counter was from Venice and charming as all get out, and that he topped my cup of gelato with a bit more when I said it looked skimpy (I was hungry! ), but he recommended two varieties that tasted like magic together. One was their very robust espresso gelato and the other their “specialty” — crema di Grom, made with cream, “corn biscuits” from the Langhe region and bits of shaved Teyuna chocolate from Columbia. I also sampled their cassata (with bits of candied fruit) and their white fig gelato, which was divine. Sitting outside at a little cafe table, with the sun shining brightly through my plastic gelato spoon, and Italian spoken all around me, I must say that my trip to Italy had a delightful hiccup. Sad that Faicco’s (the legendary pork store) was closed that day, I had a strange hankering for mortadella and buffalo mozzarella. I don’t know how to make gelato and so instead I offer you another kind of intense, velvety frozen confection from Radically Simple — with a similiar mouthfeel and memorable flavor. A bit of chipotle smolders behind a chocolate chill. It’s very cool to serve a scoop of this in a glass with some cold milk poured around it. Taste the mixture before you churn it — you might want to add a bit more chipotle and salt to augment the smoky flavor.